Invictus was one of those movies that I intentionally missed watching in the theater but was curious to rent, and I was exactly right. An "inspirational" drama (you can hardly signal "inspirational" any more than by casting Morgan Freeman), it's one of those movies built around examining a noble social injustice (in this case, the election of Nelson Mandela to lead his country out of apartheid) by providing a stolid three-act structure that instructs the characters in how to overcome their unjust circumstances to be more than they are (in this case, how the South African mostly white Springbok rugby team can become world champions, and how the entire country - black and white - can be proud of them). 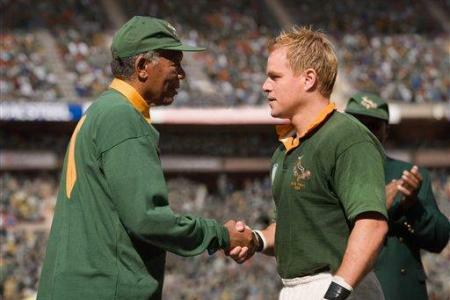 That's exactly how this movie works - from Act 1, when Mandela (Freeman) takes over the presidency and has to handle both the anger of the blacks and the resentment of the whites...through Act 2, when Mandela decides that rugby is the symbol that will unite his racially fractured country and gets behind coaching Francois Pienaar (Matt Damon) into turning his team from a joke into a serious contender for the championship...through finally, an interminable Act 3, when all South Africa is united behind the Sprinboks as they battle New Zealand for the 1995 World Cup. It's a predictable plot that moves along saved only by the deeply textured performance by Freeman (this movie, almost a gift to this talented actor, really displays why Freeman is such a movie fixture, and the effortless talent he can bring to disappearing into a fully realized character). Mandela sees not only the symbolism that the Sprinboks hold for white South Africans; he understands that only by transferring black anger against white symbols into sympathy for a new, racially integrated country can he hold together a country that's ready to erupt in racial resentments for past injustices. It's a shrewd calculation, and Freeman vividly illustrates the dilemma and characterizes a man who's own political vision has not been hardened, but rather...expanded, through years of imprisonment. Damon is bulked up and serviceable as the rugby captain who's mysteriously tapped by the new president as the country's symbol of unity, and turns around his team...but there's not much to bring to a role that's essentially a symbol. There's a single black player on the Springbok team, and naturally, this player - at first an Uncle Tom - becomes a hero to the black children of South Africa, inspired largely by Mandela's insight into the connection between childhood inspiration and sports. This seems to be the heart of the movie, and perhaps the most successful moment. Mandela essentially has saved a new generation of black youth by inviting the Springboks on a "cultural tour" to demonstrate rugby to them, turning them into fans. The new president - contrary to his advisers, who wish him to focus more on matters of state - has wisely seen the power of symbols to shape a country's joint destiny. Clearly, those advisers are there to provide some sort of tension for the film, but they certainly struck me as pretty inept at political symbolism. Given they way they're portrayed, it's hard to understand what Mandela saw in keeping them around. It's also all too inevitable that the political drama that Mandela is managing gets ultimately turned into a rugby match...so that we find ourselves having to observe South Africa's resolution through various scenes of black and white crowds cheering on the same Springbok team - or white policemen and black children hugging (in slow motion, yet!) and cheering as the Springboks win. Racial tensions are never resolved as easily as a football game, and the movie's simplified resolution is necessary to provide the essential third-act "inspirational moment," yet is also clearly false in terms of its simplistic social analysis. Such falseness is why many avoid these types of inspirational movies in the first place. Yet I was curious to learn more about the Mandela moment, and about South Africa in general. The film does deliver that - especially through Freeman's fine performance. If you find yourself fast-forwarding through the maudliny false final scenes, however, you can forgive yourself....that's why you rented, instead of sitting in the theater. And you won't miss much.